User Quota Monitor is built to look at how much space each user is taking up on a volume and comparing that against their quota. If they are over the quota, actions get fired. The Directed-Email Action is especially useful in this case since it can send clean up reminders to the end users. 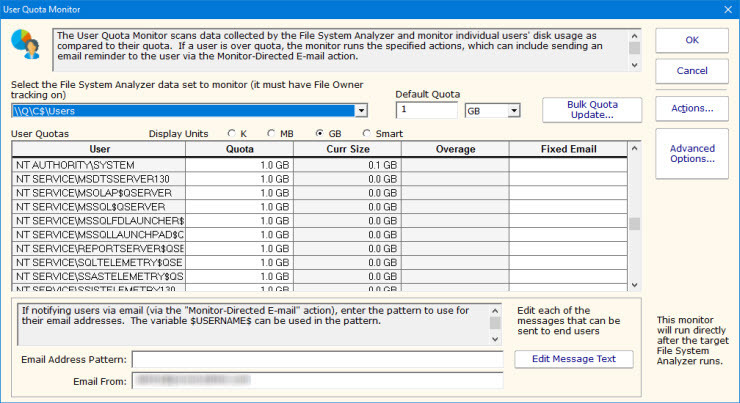 The User Quota Monitor inspects data sets collected by the File System Analyzer. This will make sense when you notice that you specify where you want the quotas to be checked by selecting an existing File System Analyzer data set. By doing this, the User Quota Monitor becomes dependent on the File System Analyzer, and is automatically run when at the end of the analysis (note that this monitor does not have the means to select its scan period--it runs after each run of the selected File System Analyzer). Configuration of this monitor works best by letting the File System Analyzer complete one scan first. That way the User and Curr Size columns will be filled in automatically. 3. Use the Bulk Quota Update mechanism which makes it easy to set many users to quotas in a flexible way. If you want the users to receive email quota reminders, be sure to add the Monitor Directed-Email action. The User Quota Monitor will need to determine an email address for each user to notify. You can either enter an email address for each user in the Fixed Email column or create an Email Address Pattern for combining the username with some text to come up with an SMTP email address. You can also edit the message that is sent to the user which can include simple replacement variables indicating quota sizes, directories, etc. Like all monitors, this monitor has standard buttons on the right for Adding Actions and setting Advanced Options.